Iran's Supreme Leader Blames Tehran's 'Enemies' For Inciting Protests : The Two-Way Ali Khamenei said "enemies of Iran" were meddling in the country using money, weapons and intelligence assets to create havoc in the Islamic country. 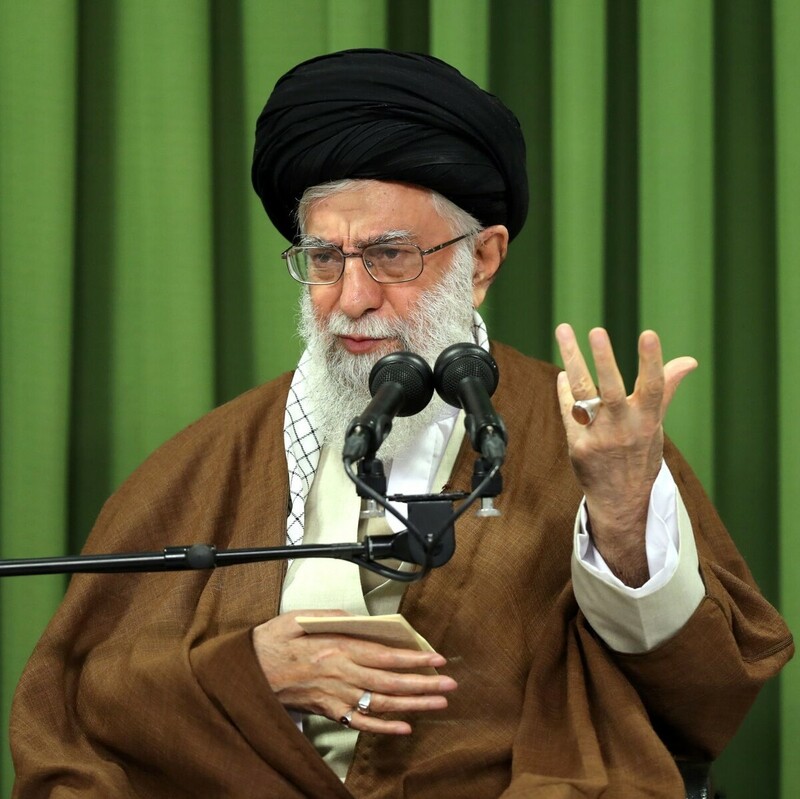 Iran's Supreme leader Ali Khamenei, speaking for the first time since protests broke out in his country last week, accuses "enemies of Iran" of meddling in the country. At least 21 people have been killed in the protests that broke out throughout cities across the country since last Thursday, over Iran's weak economy and rising food prices. Nine of the confirmed dead were killed overnight, according to Iranian state television, which reported that six of them were protesters killed when they stormed a police station in Qahdarijan. An 11-year-old boy and a 20-year-old man were killed in the town of Khomeinishahr. As NPR's Greg Myre reported over the weekend, President Hassan Rouhani issued a televised warning to protesters that his government would show "no tolerance" for anyone who incites unrest. A member of Iran's paramilitary Iranian Revolutionary Guard Corps (IRGC) was killed in the town of Najafabad, reportedly by a hunting rifle. Such rifles are common in the Iranian countryside, according to The Associated Press, but it was not clear if the IRGC member was the same police officer reportedly shot on Monday night. "[About] 450 people have been arrested with the Tehran governor's deputy giving the following breakdown: 200 on Saturday; 150 on Sunday; and 100 on Monday. The detention figures for other Iranian cities cannot be confirmed." 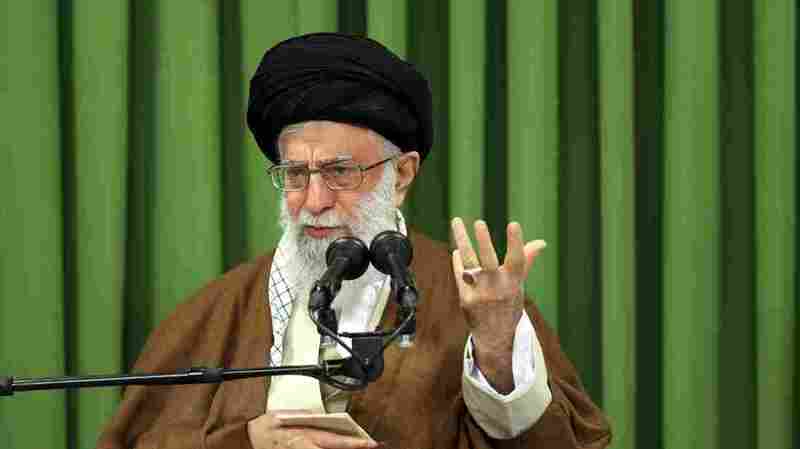 Khamenei, posting on his official website, said: "In the recent days' incidents, enemies of Iran utilized various means - including money, weapon, politics and intelligence apparatuses - to create problems for the Islamic system," he said. Iran is failing at every level despite the terrible deal made with them by the Obama Administration. The great Iranian people have been repressed for many years. They are hungry for food & for freedom. Along with human rights, the wealth of Iran is being looted. TIME FOR CHANGE! The supreme leader said he would elaborate in coming days. The AP writes: "President Hassan Rouhani has acknowledged the public's anger over the Islamic Republic's flagging economy, though he and others warned that the government would not hesitate to crack down on those it considers lawbreakers. All the protest rallies so far haven't received prior permission from the Interior Ministry, making them illegal under Iranian law." President Trump on Monday said Iran is "failing," writing in a tweet that the "great" Iranian people have been "repressed for many years" and that now is the "TIME FOR CHANGE!" in Iran.